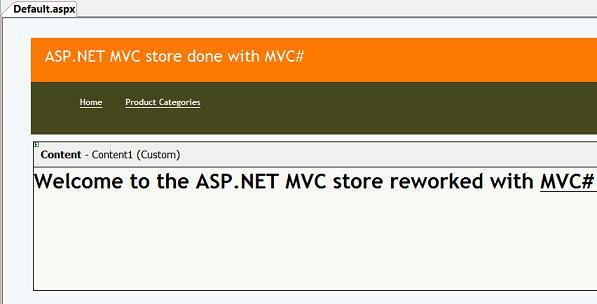 The source code of this example can be found under "Examples\ASP.NET MVC Store\" subfolder of the MVC# framework root folder. The framework itself can be downloaded from www.MVCSharp.org/download.aspx. 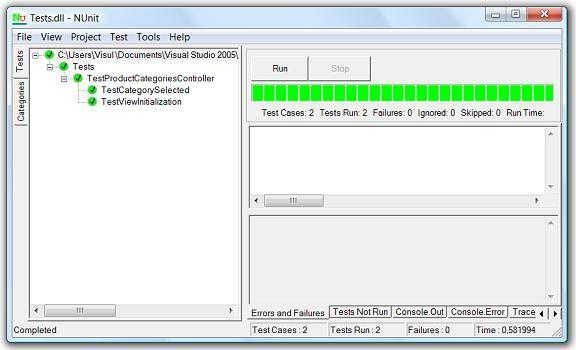 Not long ago Microsoft introduced their Model-View-Controller framework under ASP.NET MVC name. It provides a toolset for building well-designed testable 3-tier applications, which follow the Model-View-Controller pattern. However MVC is not not the only one architectural solution for constructing 3-tier applications. Another well known approach is the Model-View-Presenter pattern. MVP pattern appeared about 10 years after MVC originated. It was designed to be an evolution of MVC and to eliminate the drawbacks of the latter. And indeed, Model-View-Presenter has a number of advantages over MVC, which make MVP more favourable choice than MVC for many applications. 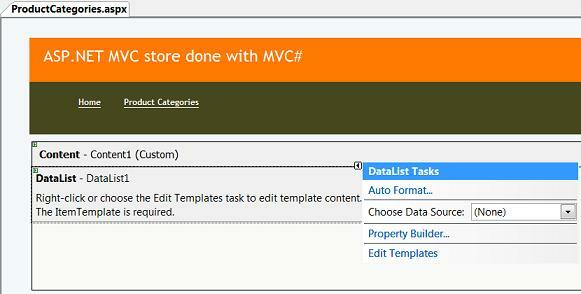 In this article we are concerning a new Model-View-Presenter framework under .NET platform named MVC#. 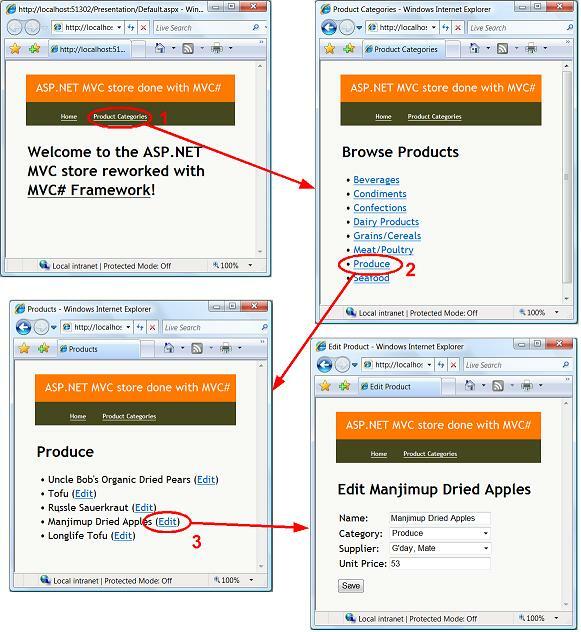 The article is based on the classic ASP.NET MVC example application by Scott Guthrie (described here: part 1, 2, 3, 4). But here we are going to reimplement this example with the use of MVC# Framework, showing the strong points of MVC# (and MVP pattern overall) over ASP.NET MVC. Model is the core of every application. It contains definitions for the application domain concepts, which the rest of the application relies on. That is why applications' design is often started with constructing the model. As for implementing the Model tier several approaches are applicable here. A developer may use the conventional .NET 2.0 datasets, or more object-oriented brand new Linq + Entity Framework toolset, or third-party tools such as NHibernate or CapableObjects ECO. Anyway neither ASP.NET MVC nor MVC# restrict developers in choosing the Model layer implementation technique. To provide a uniform access to the Model objects we will also apply the Sigleton pattern to the dataset class. 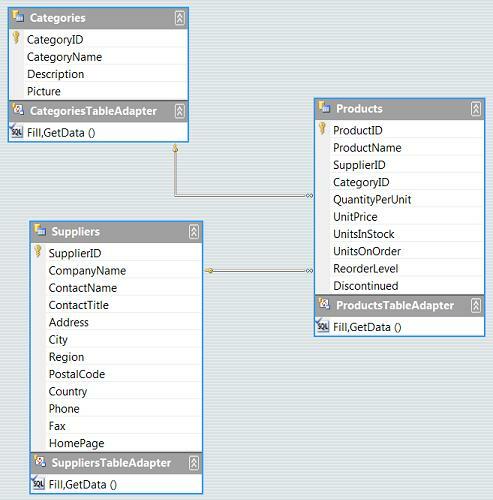 As a result we will easily access domain objects through the NorthwindDataSet.Instance object. Probably the main difference between MVC and MVP is the difference between what is called Controller in these patterns. For this reason the Controller in MVP is even referred to as "Presenter", nevertheless many authors prefer calling it "Controller" (and so do we). Let us look into the Controllers' peculiarities in the Model-View-Controller and Model-View-Presenter patterns. MVC pattern (and, specifically, ASP.NET MVC framework) breaks the standard ASP.NET web request processing scheme. According to MVC web requests (user gestures) are processed by the appropriate Controller objects instead of being processed by web pages. Based on the incoming request URL ASP.NET MVC framework chooses the controller to process the request. The chosen controller then makes necessary calls to the Model tier and chooses the view to be shown, also passing the needed data to that view. MVP pattern, on the contrary, does not violate the standard ASP.NET web request processing model. According to MVP web pages do receive web requests (user gestures). But, instead of processing requests itself, a web page delegates this job to the associated controller. The controller then, just as in MVC, makes necessary calls to the model and decides what to show to the user. The said difference underlies one major drawback of the MVC pattern. The thing is that MVC requires all user gestures to trigger a request of URL in a specific form (say, http://domain/[Controller]/[Action]). However, most of ASP.NET controls do not conform to this requirement. Instead, they generate web page events in response to user gestures. 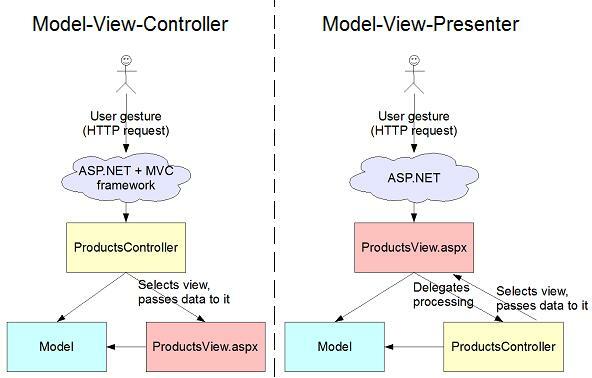 It means that ASP.NET server controls (especially third-party) better fit MVP scheme, with user gestures handled by views (web pages), and do not clearly fit MVC. By task we mean a set of views which a user traverses to fulfil some job. For example an airline ticket booking task may consist of two views: one for choosing the flight, the other - for entering personal information. Tasks often correspond to certain use cases of the system: there may be "Login to the system" and "Process order" use cases and tasks of the same names. Finally, a task may be associated with a state machine or a workflow: for example "Process order" task could be implemented with the "Process order" workflow in WWF. Navigation information specifies the possible order in which views can be activated. For instance, true parameter value in the [IPoint(typeof(...), true)] attribute definition declares the view as a common navigation target. It means that this view can be activated at any time, regardless of the current active view. In our example the "Welcome" and "Product Categories" views are common targets. Next, [IPoint] attribute applied to, say, "View 1" specifies views which can be navigated to from "View 1". In our example [IPoint(typeof(...), EditProduct)] declares that "Edit Product" view can be activated (or, in other words, navigated to) if "Products" view is active. As we already know, processing of every user gesture should be delegated to the corresponding controller method. If no user gestures are applicable, a simple operationless ControllerBase may be used. This is the case with the "Welcome" view in our example. 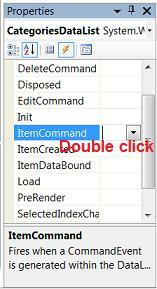 Note that controllers in MVC# should implement the IController interface. But instead of implementing it manually it is recommended to inherit its base generic implementation ControllerBase<TTask, TView> (specifying the expected task and view types as generic parameters). As we mentioned earlier most of ASP.NET controls with their server-side events better fit the Model-View-Presenter paradigm, rather than MVC. Therefore building user interfaces in MVC# applications is generally easier than with ASP.NET MVC framework. 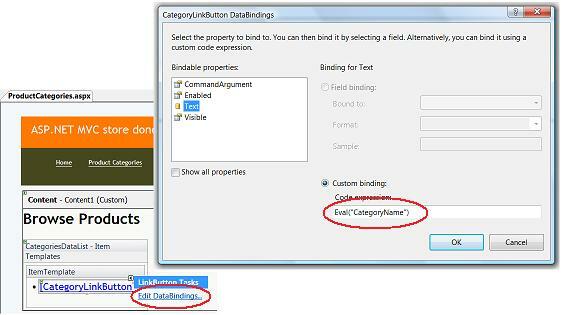 For each link's text to be the name of the corresponding category we set the Text property binding to Eval("CategoryName"). The Products view is similar in many aspects to the Product Categories view: it contains a list of objects (implemented with DataList control) with links to choose any one of them. Due to this similarity we will omit the description of any details. And again, steps to build the view are the same here: inherit the view from WebFormView<T> specifying the controller type, then design the view surface, then make it implement the proper view interface (IEditProductView), and finally make it handle user gestures by delegating the work to the controller. Since the steps are analogous we will skip them and proceed to the next article part. If desired, a reader may see how the view is implemented in the example source code. As seen above, we are using a TasksManager instance to start the task. However each tasks manager requires some configuration before using it. Above we are passing a standard configuration object intended for Web applications to the tasks manager constructor. That is all, we have successfully finished our example application, and it is ready to run! We have learned how to create 3-tier Model-View-Presenter applications with the help of MVC# framework. As an example we have chosen the ASP.NET MVC sample application to demonstrate all advantages of MVC# over ASP.NET MVC and other MVC frameworks. Applications done with MVC# are no less structured and testable and better suit modern UI controls than those built with existing MVC frameworks. In addition we should say that MVC# has support for other presentation platforms (Winforms, in plans: Silverlight and WPF) allowing to run the same application under different GUIs.